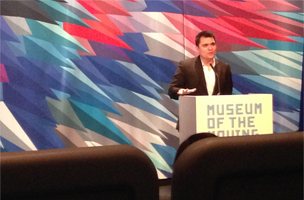 Jose Antonio Vargas introducing his film, Documented, at the Museum of the Moving Image on Thursday. Last night, Jose Antonio Vargas’ film Documented premiered in New York at the Museum of the Moving Image. The documentary, written and directed by the Pulitzer Prize-winner, chronicles his journey from outing himself as an illegal immigrant in The New York Times and his cross-country campaign for immigration reform. “This is not the film I envisioned to make, but it’s the film I needed to make,” Vargas said, when he introduced the film. Vargas’ piece in the Times made waves when it was published back in 2011, recounting how he was smuggled into the U.S. from the Philippines at the age of 12, and how he built a successful career as a journalist. The film shows the behind-the-scenes planning that went into the whole ordeal and the consequences that followed. “I thought I could write my way into America, that was my plan,” he said. Nowadays, Vargas is focusing on filmmaking and working on his next documentary, Whiteness in a Post-Obama America. Since he decided to out himself as undocumented, Vargas’ has gone from being a storyteller to being the central character of a story that is shaping the national discussion. “Journalism is everything I’ve ever had — it’s my church,” Vargas said. “There are people who don’t consider me a journalist [anymore] because I’ve gone to ‘the other side,'” he said. Before the film airs on CNN this summer, it will have a limited theatrical release. Check it out at the Village East Cinema starting May 2. (It’ll also be playing at the Landmark Regent in Los Angeles starting May 9). FishbowlNY recommends bringing tissues.